Why is it that since the Christian church essentially created the phenomenon of the university, c. 1200 (to reconcile Greek philosophy with Christian theology), and since Christianity created arguably the most notable universities the world over, e.g., Sorbonne, Oxford, Cambridge, Harvard, Yale, Princeton, William and Mary, Notre Dame, etc., that only Christian ideas are not allowed on some of our campuses — in the name of tolerance? Father Junipero Serra (d. 1784) was responsible for beginning these missions and that school, and he is buried at the one in Carmel by the Sea, the Mission San Carlos Borromeo de Carmelo. 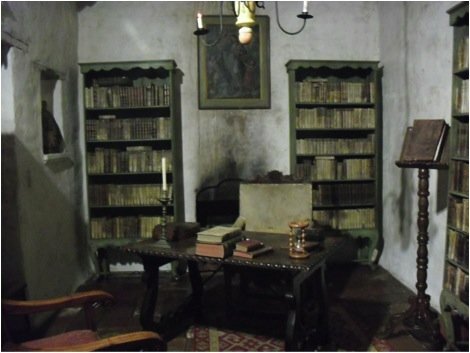 I visited that mission and took a photo of his library — the first library in the entire state.